A coral reef facing certain destruction was moved from harm’s way. Will it survive? 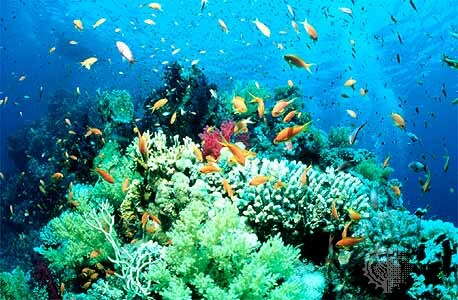 We care about corals, an indicator species to global warming, and an integral part of the marine life ecosystem. That’s why all the construction development in the Gulf (with or without a debt hold) scares us. Some hopeful news: a group of coral, located near the Persian Gulf off-shore Safaniyah oil field, was in danger of being destroyed by an oil pipeline being laid in the area where they were located. But the oil company relocated them. The coral reef or assemblage was discovered only 100 meters offshore in the Safaniyah oil field, said to be one of the largest offshore oil fields in the world, and now producing as much as 350,000 barrels of oil a day from 25 wells. Being right in the way of a trench being dug for a new oil pipeline, an ARAMCO spokesman said that the excavation would have destroyed the corals and it was decided to move them to another location after trying to protect the coral by using a process known as mitigation measures which are often to lessen the environmentally destructive impact of various construction projects on the natural surroundings. The coral assemblages were moved by special contracting companies, Reef Ball Australia and Reef Ball USA, who are specialized in relocating natural coral formations as well as constructing new artificial reefs for the growing of new coral assemblages. The project took three weeks to complete and moved over 500 small colonies of coral to a new areas 700 meters away and a similar distance from the beach. Other marine life species, including fish and invertebrates were moved as well. The operation was said to have occurred during a cuttlefish breeding season, which resulted in cuttlefish eggs being deposited in a number on unusual places, including concrete coral bases, diving gear, coral transfer baskets, and coral colony tags found in the nursery area. Marine biological experts, working with ARAMCO, the Saudi state-owned oil company, said the transfer operation saved the corals from certain destruction; and that new artificial concrete bases installed to the coral to attach themselves to will help preserve the coral population in the area. With this project taking place in the Persian Gulf, and virtually in so large an off-shore oil field, it appears that oil companies like ARAMCO are trying to preserve area marine life, while drilling and extracting the very substance that is contributing the most to global warming. With this in mind, we can all wonder for how long coral formations and other marine life will be able to remain in bodies of water like the Persian Gulf, especially due to all the other environmental problems this area has, as we’ve covered a number of times on Green Prophet. This is especially true in light of all the commercial construction projects currently going on in places like Dubai and Abu Dhabi, also located in the Persian Gulf. Wouldn't it have been easier to move the pipeline instead of the coral? Gee Moe, I never thought of that!